Tankless water heaters produce hot water on demand, whereas hot tanks heat a whole tank-full of water and keep it at the set temperature. 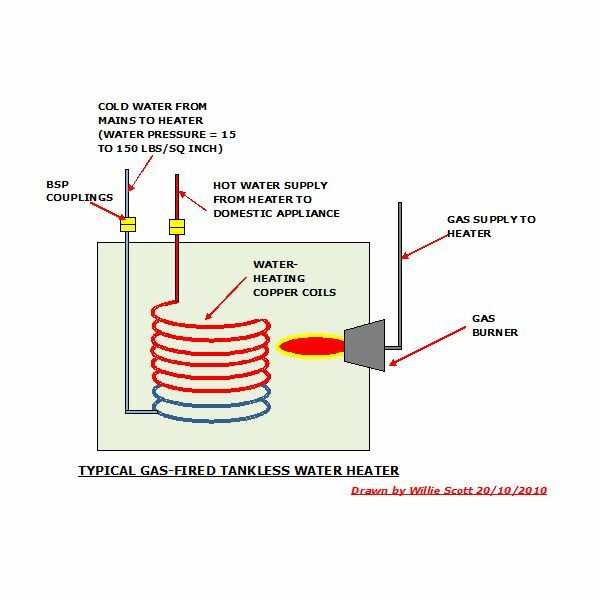 Many tankless water heaters do not have the capacity to heat water for all household appliances, but are still an efficient and economic means of heating water for domestic use. There are several good makes of tankless water heaters on the market at various prices, gas or electric fueled and different water heating capacities. Here we will examine how they operate, and compare specifications and prices. We begin with look at the operation of a conventional tank water heater and a tankless water heater. 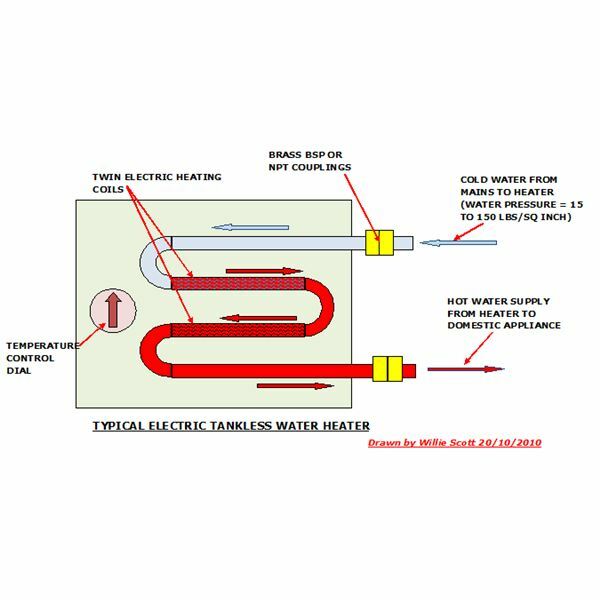 A tankless water heater operates by passing water through electrical coils in a small gas boiler burner. This type of demand water heater only operates when the water supply tap to an appliance is opened; they supply instant hot water and are ideal for showers or hand washing in a sink. Larger models can be purchased to supply the whole house; I once had an oil-fired boiler which operated on this principle, the system required no hot tank, the boiler supplied hot water as soon as a system tap was opened. This is the conventional type of water heater, usually heated by coils inside of the tank. These coils contain very hot water supplied usually by the central heating system. Hot water is stored in the hot water tank, and is replenished by cold water as it is used. The cold water is then reheated to the hot water tank set temperature, usually 120-130°F. This will depend on the available supply of energy; electrical power appears to be most popular. This is due to ease of connection, but most appliances will require their own fuse box. Gas appliances are more expensive to purchase and install, but cost half as much as electric to run; you have to decide if it is worth the extra output in cash to justify long-term gain. This is known as the power rating of the appliance, for this exercise I have set the rating between 9kW and 12kW, which seems to be the most popular output. Very important to us all is the purchase price; this will be quoted excluding fitting. Most of these appliances will need a call out to a plumber/electrician, so long warranty is preferred. Check if the warranty covers parts and labor. The dimensions of the appliances are important as most of them will be required to be fitted close to where the hot water is required. Dimensions will be included where given. Note: Some of the Tankless Water Heaters qualify for a Government Grant, as these change frequently, I have given the relevant websites below for you to check out, when selecting a new heater. 2. energystar – grants for tankless water heaters. A UK model, it is compact and can supply a shower comfortably. White exterior with copper internals, water pressure range 1 to 7 bar (15lbs/sq. inch to 115 lbs/sq. inch), to suit most water mains, along with ½" BSP (British Standard Pipe) connections and overheating protection. Fuel Type: Electric Power; new breaker/Fuse box required additional to mains fuse box. Warranty: up to 3 years. Made in the USA, this is a superior tankless water heater, which can supply a couple of outlets such as a shower and dishwasher simultaneously. It is a very compact and stylish heater, finished in gray. It is not necessary to hide this in a cupboard, but hang it on a wall near the household appliance it is to supply will be a feature to any bathroom or kitchen. Fuel Type: Electric Power; new breaker/Fuse box required additional to main fuse box. heaterstore: Tempra 12 Outlet for USA. hygienesupplies: Tempra 12 Outlet for UK. This tankless water heater runs on natural gas. It is rated at 140,000 BTU/hr which is around 30kW, so should be capable of supplying the whole house with hot water. Surprisingly, it is not that expensive. It may be a good investment if your present hot tank system needs replacing. Manufactured by Noritz Water Heaters, it has a zinc plated casing, copper internals and stainless steel flu. It has a high energy factor or star rating (88% efficient) and not much bigger than the average electric water heater. Operating pressure is 10-150 lbs/sq inch, with ¾" NPT water and gas connections. A quick word about gas tankless water heaters; look for direct ignition – no pilot light. Pilot lights stay lit at all times consuming gas unnecessarily, thus direct ignition is much more efficient and economical. Manufactured by Noritz Water Heaters with output at 140,000 BTU.